It’s the “LP” after the name that’ll earn us the K-1 come tax time. But this isn’t a dead end. There is a way to buy a basket of these stocks for more yield and minus the K-1 hassle. We’ll discuss the details and the tickers in a minute. First, let’s look at the cash flows that power these payouts. MLPs themselves are, like many things in American culture, a successful product of the 1980s. Congress gave them the hall pass on federal taxes provided they pass along most of their profits to their “partners” (or shareholders) in the form of dividends. 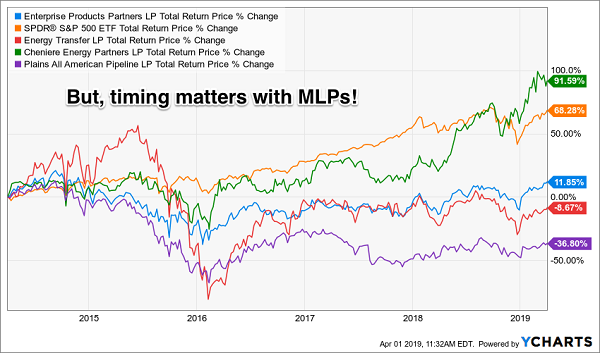 In this respect MLPs are quite similar to real estate investment trusts (REITs), which likewise must dish 90% of their income to shareholders as dividends. While we think of REITs as landlords, MLPs operate like toll bridges. REITs collect rent checks while MLPs charge their customers for moving oil and natural gas from here to there. What’d 2014 investors in these issues do wrong (other than securing five tax seasons of hassle)? They bought the line about MLPs being insulated from energy prices. In practice it’s much better to buy MLPs when energy prices are in the tank with nowhere to go but up. A way around the tax hassle. 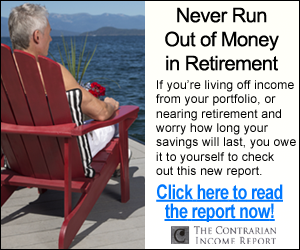 Savvy contrarian income seekers are familiar with closed-end funds, or CEFs. They are similar in flavor to mutual funds and ETFs but better because their prices are simply inefficient. They trade just like stocks. Their prices swing more wildly than their underlying value. They are subject to greedy legs up and fearful drops. Which makes them perfect for those of us who prefer to buy low–we get regular opportunities to do so! Another benefit of buying your MLPs through CEFs is that they’ll replace your K-1 collection with one neat 1099 form. The latter is much easier for a tax professional, or you, to handle every April. It’s better to buy these funds when energy prices are in the tank. 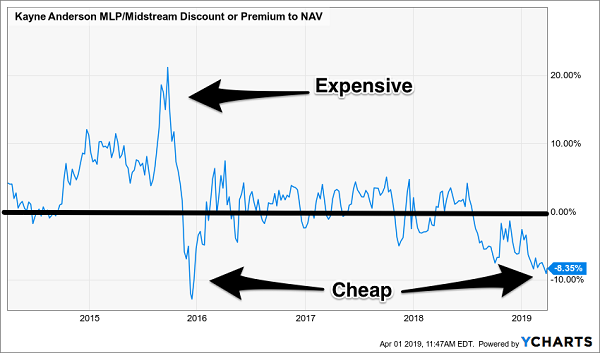 For example, with oil down earlier this year I asked readers to consider the Kayne Anderson MLP Investment Fund (KYN), which was paying an amazing 11% and trading for just 94 cents on the dollar. KYN proceeded to rocket 17% higher in three months! Should we buy now? I would prefer to see a pullback in the price of oil first. According to my favorite contrarian indicators for the black goo, hedge fund managers are a bit too bullish on energy for my liking. And I’ve found that their sentiment is the driver of short-term oil prices. When they are greedy, the goo is more likely to drop in the coming weeks and months. What about an ETF like the InfraCap MLP ETF (AMZA)? This is a rookie play on the sector because, as an ETF, the fund will never trade at a discount to the value of the shares it holds. As I write AMZA trades for a 0.1% premium while KYN fetches an 8.4% discount. Why would you pay $1.01 for a dollar in assets when 91.6 cents will do? Plus KYN has outperformed AMZA since inception (even when accounting for fees). The lesson here, as always, is to buy a smart CEF and leave the basic ETF to the basic investors. 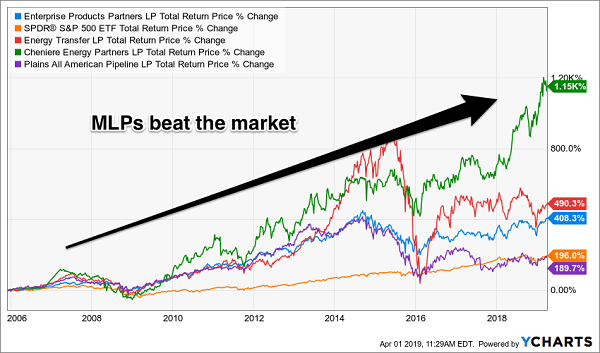 While I don’t quite like the current setup for MLPs, I do love the short and long-term prospects for five “pullback-proof” dividend payers yielding an average of 7.5%. If you’re worried about a pricey stock market that seems to defy gravity every day, here are five solid payouts you can purchase today without worrying about an overdue pullback. The “cash or bear market” no-win quandary inspired me to put together my 5-stock “Pullback-Proof” portfolio, which I’m going to GIVE you today. Rock-solid (and growing) 7.5% average cash dividends (more than my portfolio’s average). A share price that doesn’t crumble beneath your feet while you’re collecting these massive payouts. In fact, you can bank on 7% to 15% yearly price upside from these five “steady Eddie” picks. With the Dow regularly lurching a stomach-churning 1,000 points (or more) in a single day during pullbacks, I’m sure safe—and growing—7.5% every single year would have a lot of appeal. And remember, 7.5% is just the average! One of these titans pays a SAFE 8.5%. Think about that for a second: buy this incredible stock now and every single year, nearly 9% of your original buy boomerangs straight back to you in CASH. If that’s not the very definition of safety, I don’t know what is. These five stout stocks have sailed through meltdown after meltdown with their share prices intact, doling out huge cash dividends the entire time. Owners of these amazing “pullback-proof” plays might have wondered what all the fuss was about! These five “pullback-proof” wonders give you the best of both worlds: a 7.5% CASH dividend that jumps year in and year out (forever), with your feet firmly planted on a share price that holds steady in a market inferno and floats higher when stocks go Zen. 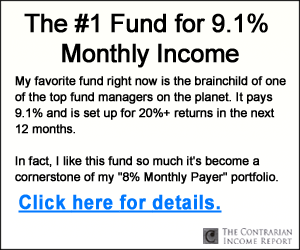 Click here and I’ll share the names of these five ultimate income investments, including their tickers and ideal buy prices along with my full analysis and research.